Harper Beckham is known for A-Z designer closet whilst, being held too and from locations by her fashionable parents. Whilst gaining her own style file across so many of large publications amongst the return too the UK with family. There was no better way to start on British soil then having a shopping therapy in Selfridges Celine department. 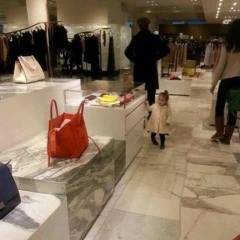 Harper amongst her famous parents who was spotted in the department store this weekend. * Due to my investigation this the first pictures of Harper to be published on blogs without, being featured in any other publications.